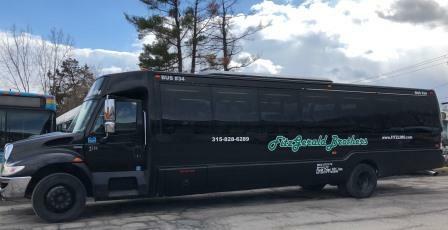 TCAT has teamed up with Fitzgerald Brothers, a local charter service that is leasing TCAT two 37-foot buses to help alleviate bus shortages that have been causing service disruptions. Effective today, TCAT is using the Fitzgerald buses on its rural routes serving Enfield, Trumansburg, Lansing, Dryden, Caroline and Newfield during a.m. and p.m. peak time on weekdays. This is relieving strain on TCAT’s fleet and freeing up TCAT buses to serve heavy commuter routes. Even with the additional buses going into service, TCAT was still forced to cut some trips today, but the situation should improve as TCAT implements other solutions, such as using third-party maintenance shops to assist with routine maintenance. Smith said Fitzgerald drivers are operating the buses, but each bus is also staffed with a TCAT driver to assist with route information, passenger questions and fare collection. Last week, TCAT announced that finding solutions to bus shortages is its No. 1 priority. When there are bus shortages, dispatchers typically reduce service on high-frequency routes, such as routes 10, 30 and 82, knowing that riders can more easily catch the next bus in a shorter period of time compared to less-frequent rural routes. Nonetheless, some riders are being inconvenience and TCAT is striving to approach zero missed trips in the near future. Bus shortages are a result of a number of factors including aging fleet and more stringent NYSDOT regulations. Recently, TCAT restructured its maintenance management team to better meet routine maintenance schedules to keep buses road ready. Additionally, TCAT in recent weeks purchased five used buses at auction and they are presently being rehabilitated for inspection and to go into service. In the meantime, TCAT is continuing to look at other transportation companies to lease or borrow additional buses. Inbound: 5:30 p.m. and 6:32 p.m. from Enfield Highway Dept. Outbound: 3:55 p.m. from Green St. Station.